If you have a passion for the prehistoric, then the Gillespie Museum at Stetson University in DeLand should be on your list to visit. This teaching museum is celebrating its sixtieth year and has more to offer than ever. This year I decided to dig in (get it? Dig?! LOL) to Florida nature and our unofficial state mineral, calcite, made the list. A private collection is on display right now. Super rare specimens from Dr. Tom Scott. He’s like a superstar of the rock world. Wait, he literally rocks! He also climbs around in caves hundreds of feet below us to find some of these unique specimens. Look at how incredibly they have formed. Ok, so full disclosure, I LOVED my geology course at the University of Georgia but was miserably bad at remembering all the different types of rocks and minerals. It’s like a beautiful puzzle. And I’m TERRIBLE at puzzles. Zero patience. So, a little research is in order to be able to get this right. Calcite is found almost everywhere. It’s THE most common of rock forming minerals. 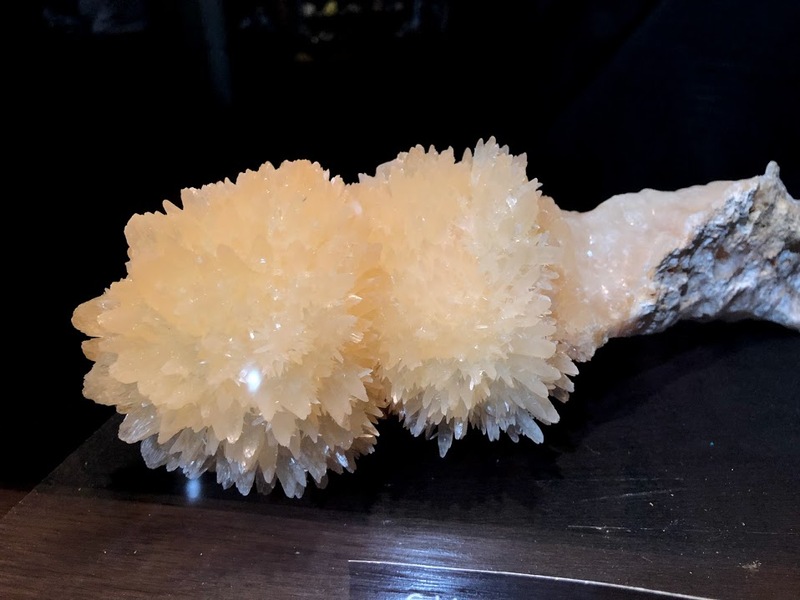 The thing about the calcite in Florida is HOW it’s formed. You can see the crystals take on a life of their own in patterns and shape, length, and color. The Mohs scale is what’s used to measure a rock or mineral’s hardness. Think about a diamond, which is at a 10 and the hardest. Diamonds can even cut glass. Talc, think talcum powder, is at a 1. (Yep, talc is a mineral, btw.) Calcite is stuck at 3. Which means it’s pretty soft stuff. And fragile. Which makes this collection even more impressive. Look at all those peaks and valleys that haven’t fractured or broken. If you want to ask Dr. Tom how he MOVES THIS COLLECTION from place to place, you can catch him at the Gillespie Museum on February 21st. If you miss him, go anyway! The stuff is marvelous to look at. The Gillespie Museum is located on the campus of Stetson University in DeLand, Florida. FREE! Donations keep the museum open and available as a location for teaching and learning.